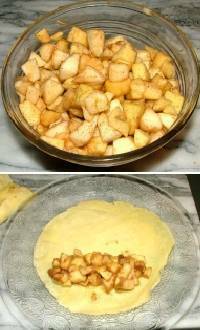 Québecois filling - So called for the apple and maple syrup, this filling makes for a delightful and satisfying desert crepe. Chop apple to (irregular) 3/8" (1 cm). Coat apple pieces well with maple syrup. Sprinkle cinnamon, a pinch of nutmeg and 1 teaspoon of flour per cup of apple. Stir well to coat apple. Move apple mixture to saucepan and fry on low heat, stirring constantly until apple is softened. Add water, about 1 tablespoon at a time - as needed, to help keep the apple mixture from sticking and to maintain a little bit of sauce. Take from burner and set aside for later use. Like most crepes, the Québecois is a beautiful crepe filling - perfect for breakfast or as part of a brunch or as a snack at almost any time of day. The Québecois is also delightful dessert crepe. As a dessert crepe it may be served with a little ice cream or a bit of maple syrup drizzled across the top of this sweet delight ... or in true Quebec style, a dolop of ice cream drizzled with maple syrup.